For all the frustrations we encounter while we spend a winter here, there is plenty of reward. The greetings of close friends will always be remembered, but so will the greetings of the bakers, shopkeepers, and a multitude of other casual acquaintances. The memories in our minds seem never to be of dusty streets, honking horns and the like. Instead we remember lunch along the Nile. 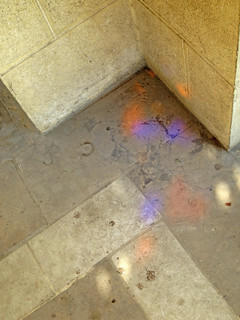 Or patterns of light on the pyramids. 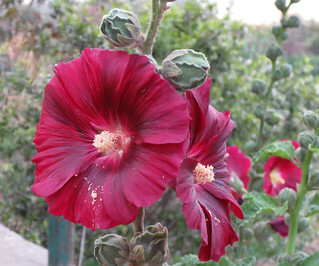 Or that outing in the desert near Fayoum. 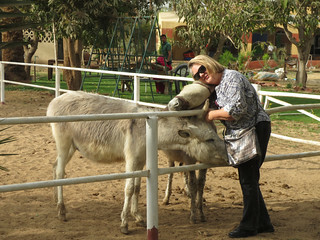 It doesn't take long to reach the countryside and there is always time to stop for tea along the way or a donkey to hug. And time never permits me to share nearly as many stories as I would like. So to find out what this picture is all about, you'll just have to wait until we get home and can explain it in person. This past year, we had to pay a number of special assessments, however. There were problems with the elevator and the water pump. My neighbor across the hall who happens to handle the money for the association was sorry to have to bring me the bad news when we arrived in January. These repairs came to 675 E.G.P. 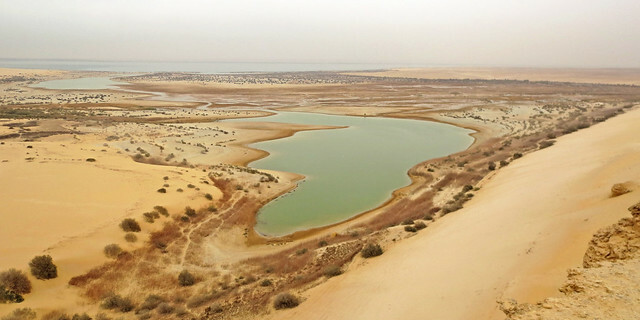 (90$ U.S.) 300 of that was to cover a negotiated settlement for water that had not been billed to the building for several previous years. The good news was that the association was now in possession of a backup water pump should we have another failure. 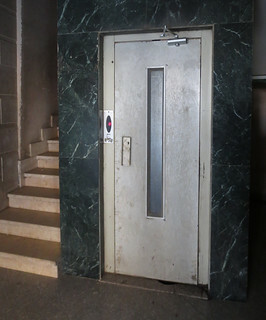 Here are pictures of the ground floor elevator door in the lobby (it had to be replaced) and the "mechanical room" under the stairway with the pump. 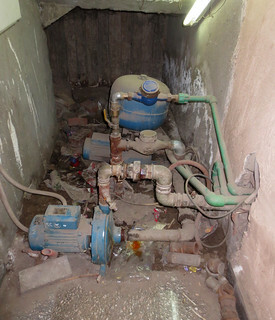 The pump installation is a little rough by western standards but it works well almost all of the time. We also pay for garbage/trash collection and our electricity. The garbage collection fee is 10 E.G.P. ($1.33 U.S.) per month. They come by three times a week. We seem to maintain a closer relationship with the trash collection folks than most people here. They get cookies during our stay and most of whatever might be left in the refrigerator at the end. Electricity is the big item. The accumulated bills for the past twelve months total 240 E.G.P. - about $31. Our monthly minimum when we are not here is 4.15 EGP or 55 cents. I can live with that. 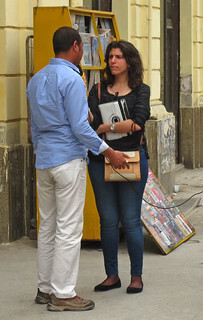 Our visit to Talaat Harb square on Saturday was our second visit during this stay. 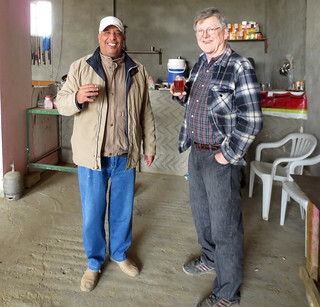 We had been pleasantly surprised with a major renovation effort taking place and wanted to return and check on progress. 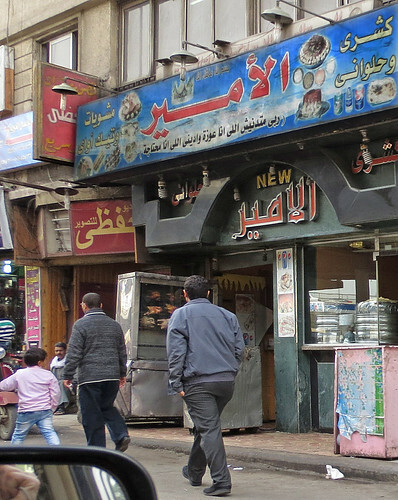 Talaat Harb is probably Cairo's second most famous public space after Tahrir Square. 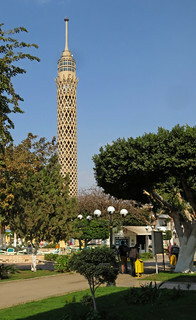 Tahrir has undergone a remarkable facelift over the past year. I will return to that subject in a later post. 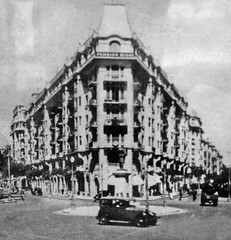 But Talaat Harb is being restored to something approaching the grandeur of its "heyday" in the middle of the past century. 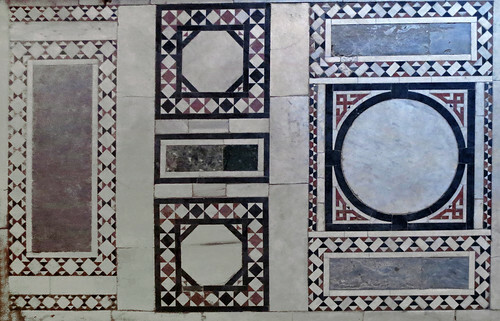 The restoration is all but complete on a few corners, still in progress on others. 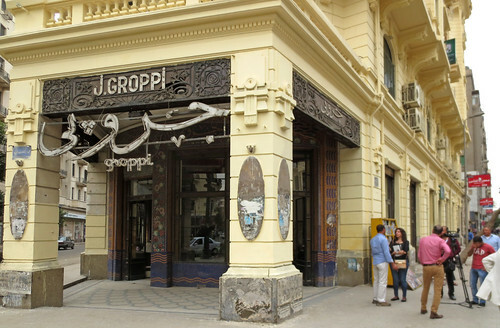 Work on the interior of Groppi's famous pastry and chocolate shop is underway, and the famous nearby Cafe Riche appears to be getting a facelift as well. 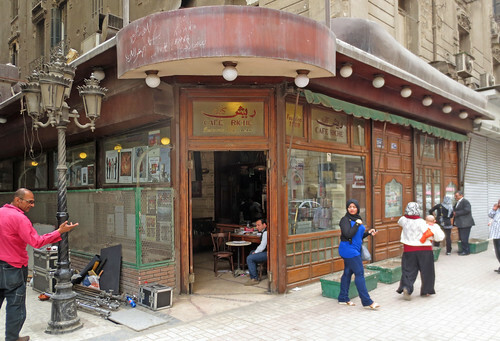 Cafe Riche opened in the early 1900's and became an intellectual hub where writers like Naguib Mahfouz could be found. Wouldn't it be nice to see some pictures from "back in the day" and compare one to the present? Fortunately, Cafe Riche has some old, faded black and white pictures posted in a window. 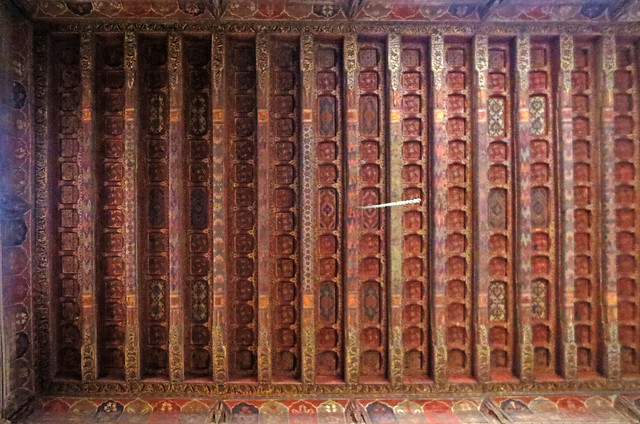 A couple are looking at them at the right edge of the picture above. 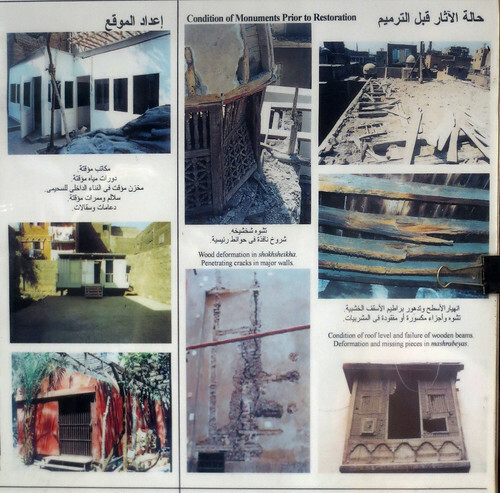 A look at this picture from several years ago will show the need for a good cleaning and restoration. If you have a very sharp eye, you will notice that something looks different about that statue in the center in comparison to the old snapshot shown above. You are correct. 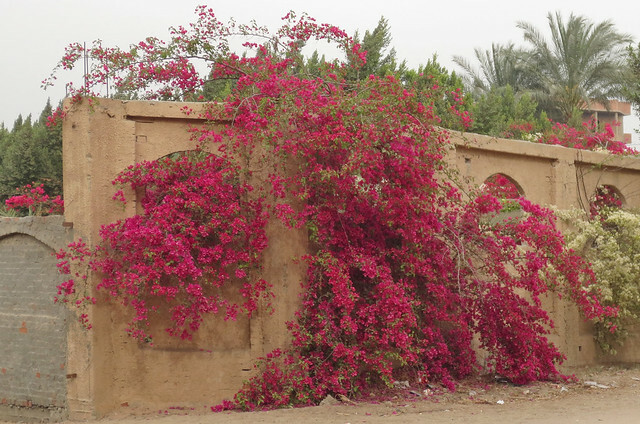 This was once Soliman Pasha's spot. 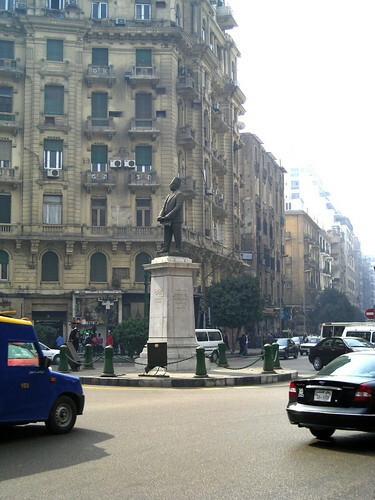 Talaat Harb was an Egyptian economist whose fame was available at a convenient time landing him a spot in the center of this street of banks and other modernizations from the World War II era. More on that story can be found here. The statue, of course, has considerable symbolism and was cast by our favorite coffee mug-maker, Fathi Mahmoud. 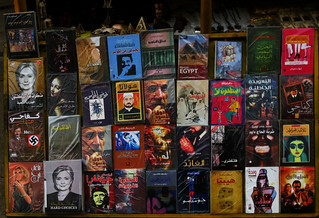 What Are They Reading in Cairo? 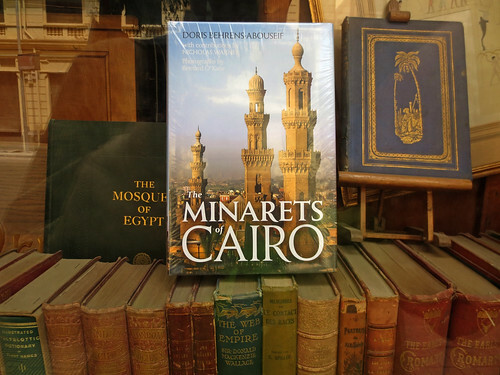 I don't know, but it seemed like the best way to find out was to go downtown to Talat Harb Square and check out the booksellers. 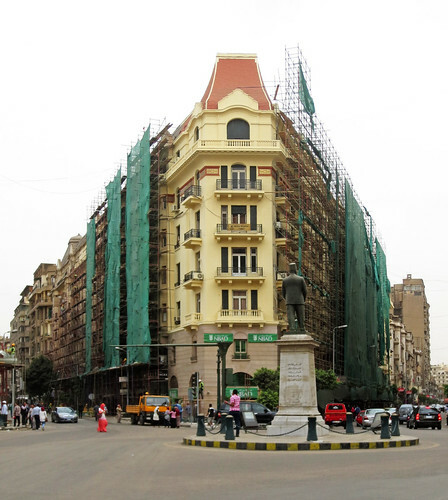 Talat Harb is a brief stroll from Tahrir Square and a case could probably be made for why it was once the intellectual capital of the city. 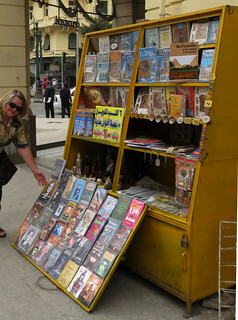 We found this selection of books set up near Groppi on the square. Linda is checking out the Arabic language version of Hillary Clinton's Hard Choices. There is probably no better choice than the Groppi corner to conduct "man on the street" interviews on the topic of the day. The question was, "If you want to know if something is forbidden or allowed in Islam, which authority would you ask and believe? 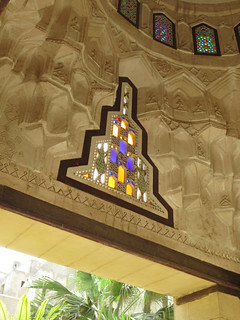 The Salafists or Al Azhar?" We thought this was a very divisive question that should not be asked. 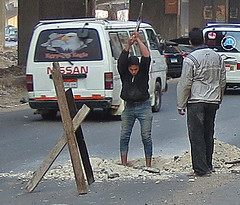 There are enough problems in Egypt without creating more. I don't know which station to watch to view the results. Perhaps it is just a YouTube venture. There are other books available in the neighborhood and I don't know how I got past this antique book shop without going in. 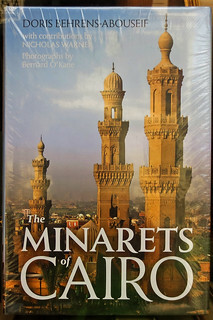 The minaret book is a pricy thing on Amazon (about $80) and I might have been able to drive a better bargain here with Cairo's flexible price system. I'll have to check for it again next year. Walking around the square, the fragrance coming from the bakery was overwhelming. We stopped in to buy some bread items that made the perfect accompaniment this morning while editing photos and posting them to the blog. 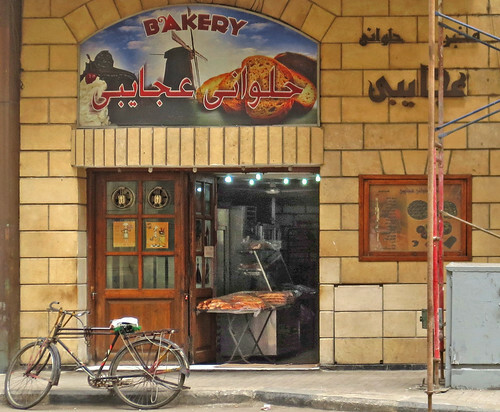 An "inside bakery" is not common in our neighborhood so it was worth buying bread just to see the inside. Where we live the bakery items are displayed on tables outside the building. To help protect from the ever-present dust/sand, all items are covered by plastic but not all bakeries provide this amenity. 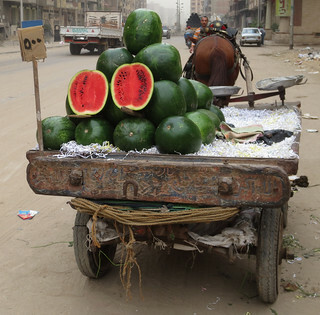 We know it is almost time to leave when we begin to see the new crop of garlic on the streets - and the ripe watermelons begin to show up. 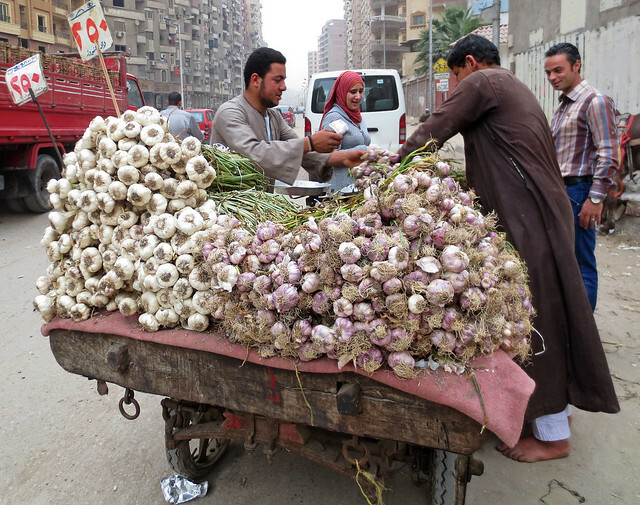 As we understand it, the price of garlic soars to around 25 EGP for a kilogram (86 cents per pound) just before the new year's crop is harvested. 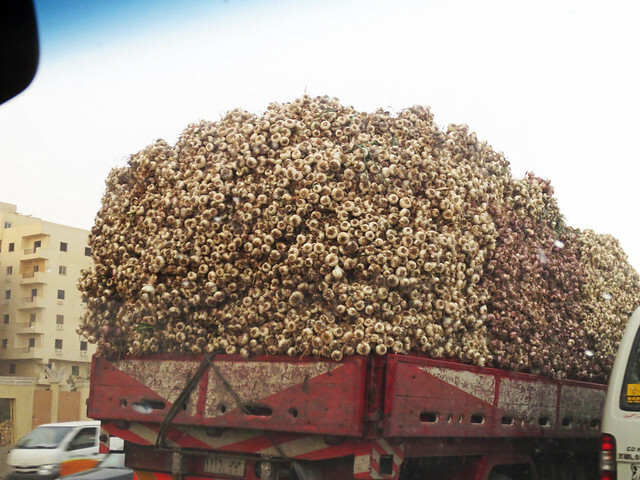 Early in March, the new crop appears - by donkey cart, by truck - you have never seen so much garlic. Prices respond as you would expect and soon garlic can be had for 2.5 EGP/kilo (15 cents per pound.) When we exclaimed "A kilo of garlic?!!" our friend said, "Egyptians use a lot of garlic and they buy a lot to last until next year." We would bring home suitcases of garlic to distribute to friends and family but it's expressly forbidden at customs. 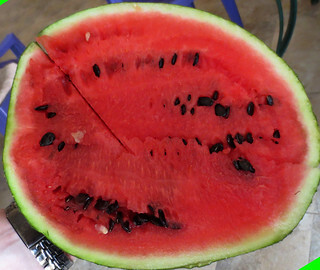 But this is also the beginning of melon season. 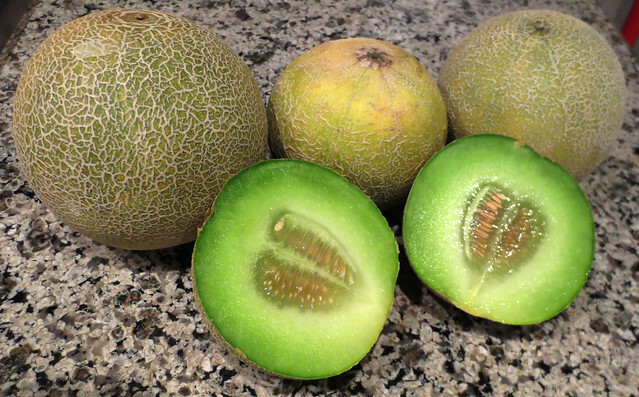 These small softball sized melons are wonderfully sweet. 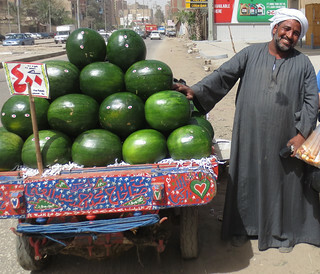 And again, this year, we didn't find this friendly watermelon salesman on the left. 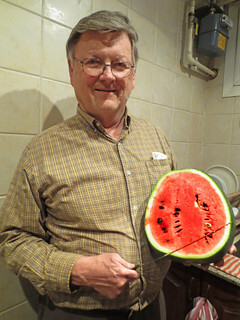 But there are plenty of melons available. They are sweet and juicy again this year. But, note the price increase 4 EGP per kilo to 5 EGP over the past two years. That makes it 30 cents per pound this year. And the flowers! If anything says spring, it is the color beginning to cover many a garden wall. Alas, we have but three days left and lots of people to say goodbye to. 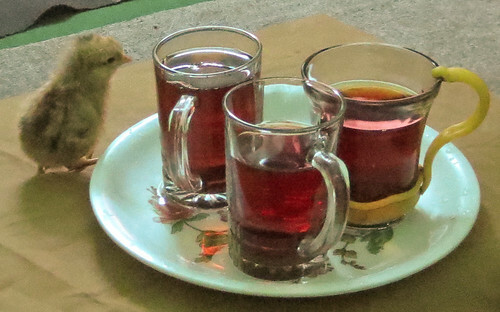 I am getting close to my last blog post and may have to carry on with some after I return. Since our telephone land line won't be arriving until April, we thought it might be good to authorize a friend to act in our absence. That requires some paperwork. 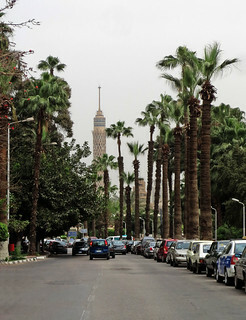 In Egypt, you can authorize someone else to act on your behalf, for example, to drive your car and stay out of trouble with the police, by signing some paperwork in the presence of a government employee. I gather that it is sort of like signing something in front of a Notary Public. Of course, these government officials are not found in every bank, real estate office and the like. They work at the Mugamma and a few other government offices. 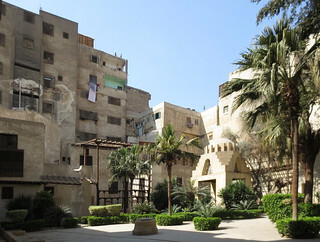 One such place is located on the edge of Giza Square. 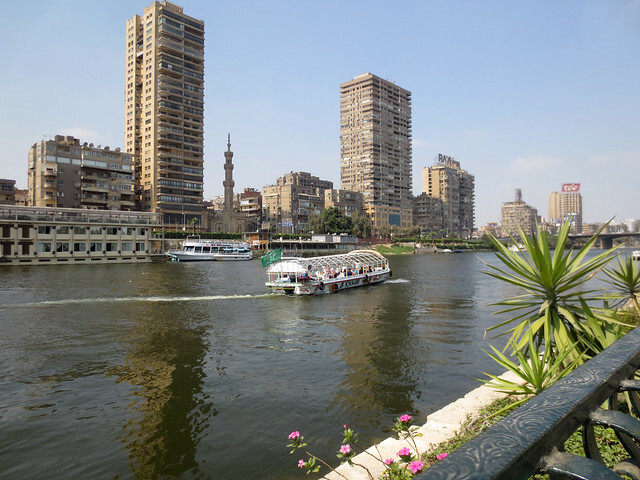 Now, Giza Square is not on most tourist itineraries as a destination. It holds the confluence of a railway station, a metro line, a great many micro-buses and a lot of people. It reminds me of my first visit to the Grand Central Station bus terminal in Manhattan in the early '70s. 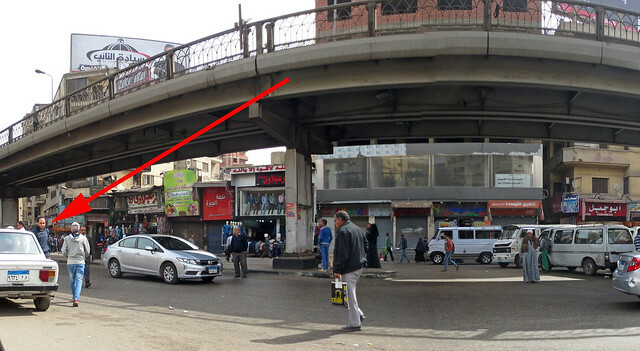 We arrived and found a parking space beneath one of the elevated roadways that normally lets you bypass the square. We moved on foot to the area shown by the arrow. Soon we were passing this koshary restaurant and approaching the wooden door of a photo studio - right behind that chicken broiler. 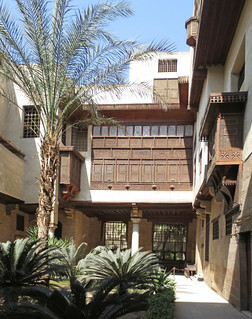 The entrance to the photo studio also serves as the entrance to the government office on the second floor. Proceed up the stairs. There are some images that can't be conveyed via photography. This is one. 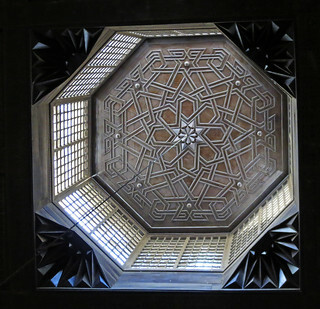 It would take an outstanding writer to conjure up the images of a dark, echoing concrete stairway with people moving in both directions and arriving at the second floor landing. There we faced an array of tiny rooms with peeling institutional-green paint along with desks and chairs that might have been castoffs from a 1950s insurance company. I though back immediately to Jack Webb as Sgt. Friday preparing to interrogate a subject beneath a harsh bare bulb. Our friend presented our situation and my passport to the official in charge of the second room we entered; the first room bureaucrat had rejected us entirely. The official carefully examined each page in the passport seeking the correct type of visa. We flunked the test. "Lazim" was the word Linda heard repeatedly. It translates to, "It is required." Well, then, perhaps an appeal to the senior official in charge? But it was only 10 a.m., so he hadn't arrived at work yet. We moved on to other, simpler tasks. Our friend needed help with his smartphone. 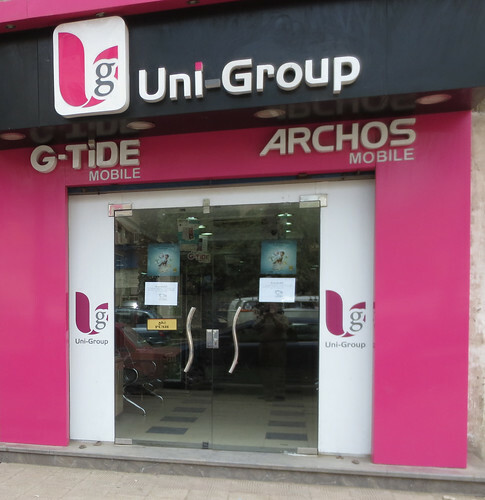 This modern privately owned cellphone office provides service to its customers with a smile in a pleasant environment honoring the one-year guarantee on its products. They will also swap out your 2GB memory chip for a new 16GB one, saving all your data and only charge you $7 for the service. 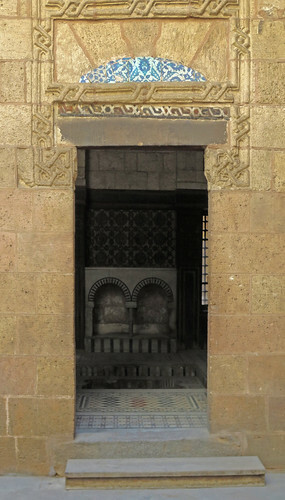 Later in the day, I showed the picture of the door to the government office to another friend. His eyes brightened with immediate recognition. 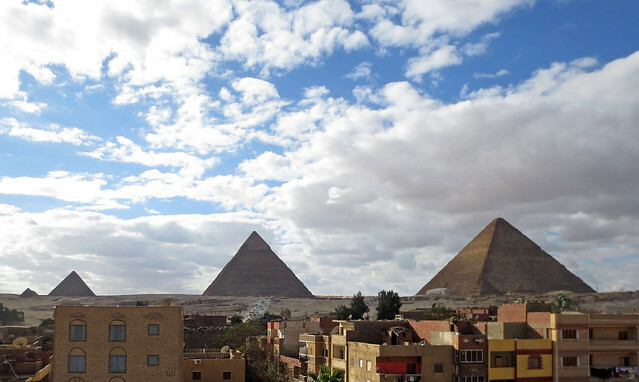 "Oh, did you go to Giza Square? Did you need to sign some papers?" I guess everyone in this part of town knows that unlabeled stairway behind the chicken broiler. As Linda reminds me with some frequency, when we arranged the purchase of our Condo back in 2006 I said, "No, we don't need a telephone line." I wasn't thinking about the internet at the time. As our internet service via 3G cellphone providers varied from OK to poor (and non-existent during the 2011 revolution) I came to regret the decision. Last year, we headed down to the local phone company with a friend to help us get a land line installed. 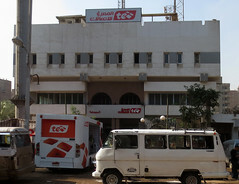 Telecom Egypt is the partially privatized Egyptian telephone company that has replaced the infamous government telephone authority dating from 1854. People waited sometimes for years to have fixed phone lines installed, and the old copper infrastructure made connections unstable. Phone lines outside major cities were failing. 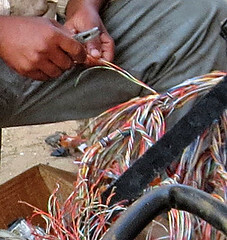 Mobile technology aided in the diffusion of phones, but the government also extended fibre optic connections throughout Egypt, upgraded the copper lines and data centres, improved the integration of applications and in general provided more fixed-line connections. Now it only takes a few weeks to have a fixed line installed. 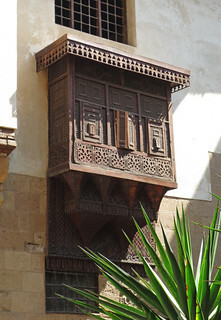 I've been told that visiting an Egyptian telephone office in "the old days" was quite an experience in middle-eastern bureaucracy. Once T.E. had to begin competing for customers with the cellphone providers Vodafone, Etisalat and the like, this changed dramatically. This is a modern T.E. 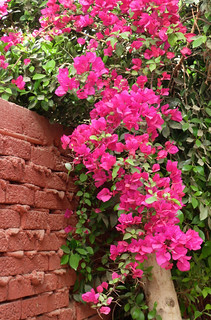 building just off Faisal street near the pyramids. There is a large waiting room with comfortable chairs, generous lighting and, during busy times, a take-a-number system. We like to arrive when they open at 9:00 a.m. to beat the crowds. We made several visits last year with a helpful friend. Unfortunately, we couldn't have a phone installed. It was necessary to visit "upstairs" with the chief engineer (just beyond the #5ESS switch room) to get to the root of the problem. T.E. was out of copper in our neighborhood. All of the phone line twisted pairs were in use. Would we settle for wireless? Well, no, that sort of defeats the purpose of getting a better hard-wired connection. Would they be installing more wires? He checked the large drawings that he had been scanning, found a number and went to a three-ring binder. "You are in luck!" he said in Arabic, " - next year, in-sha'allah..."
Although the internet service via Vodafone has been pretty good this year, we followed up in February on our land line possibility. Of course, our application had been on file for over a year so it had been discarded. We decided to ignore it. 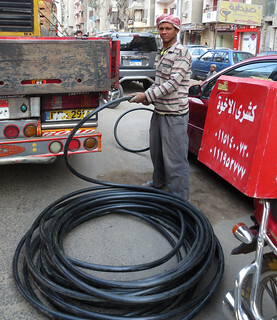 And then, I saw this fellow, spooling out cable into a shallow ditch near our building that had been hewn with pick and shovel over the previous few days alongside and out into our newly blacktopped street. 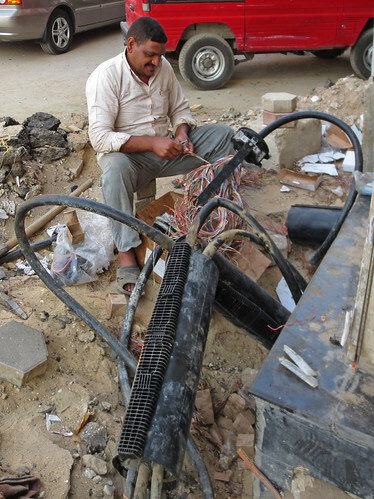 A bit farther on, as I approached our neighborhood supermarket, I saw connections being made by a telco splicer. 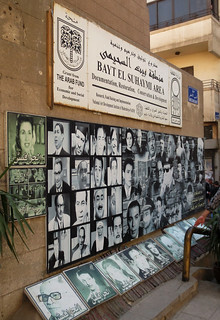 Bayt el-Suhaymi is an easy site to miss. 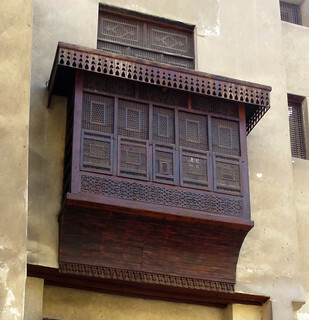 Walking down al Muizz street from Khan el Khali, you are facing the wrong direction to see this large sign, or if you do see it, you might not realize it is necessary to walk down the narrow alley to find the house. 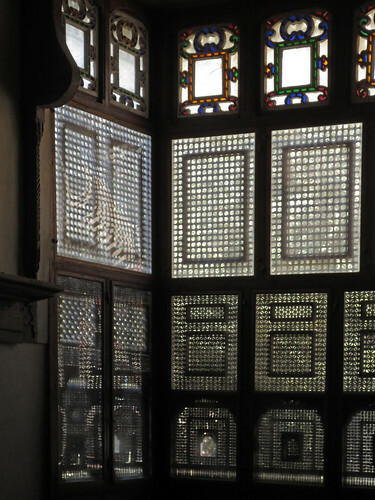 That's the almost hidden entrance below the mashrabiya windows. 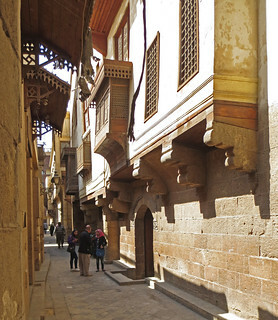 The walk down the alley is really a part of the journey back in time to see the house, as the street itself is a remnant of earlier centuries. 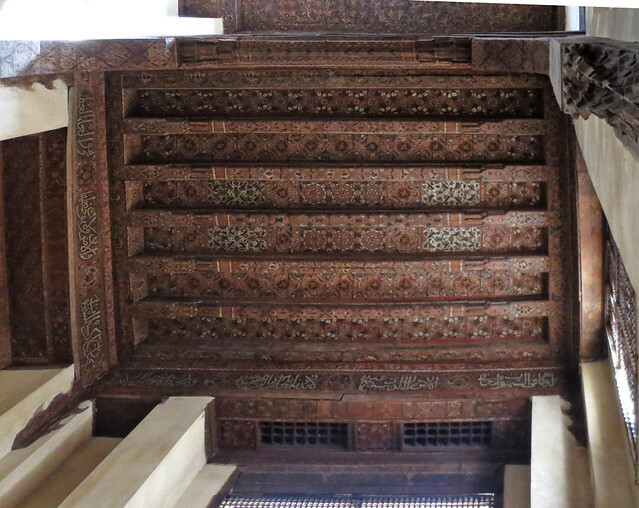 You'll have to pay an extra 35 Egyptian pounds to enter, as this special treat is not included on the regular al Muizz tour ticket. 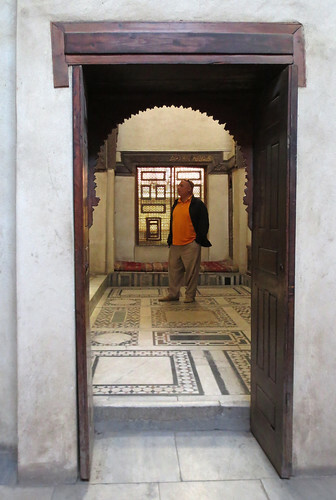 Once inside, you will find a huge house that takes quite a while to tour and is worth the admission price. There are plenty of windows. 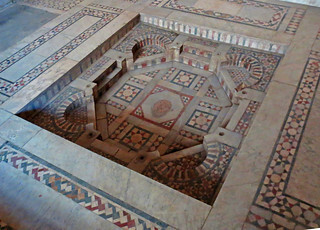 The central courtyard garden has a pleasant domed setting with stained glass on the top that casts patterns on the floor. 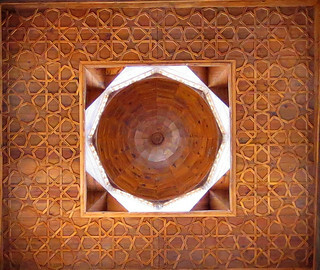 The interior rooms have many attractive patterns of light. 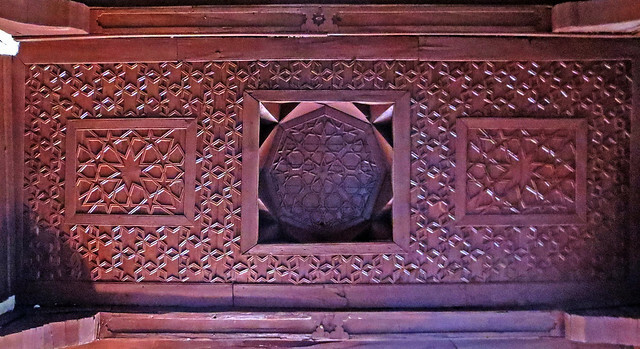 Or, if you particularly enjoy doors, there are many types. 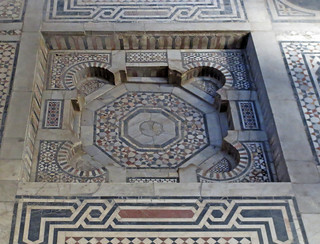 Marble inlaid floors and fountains? 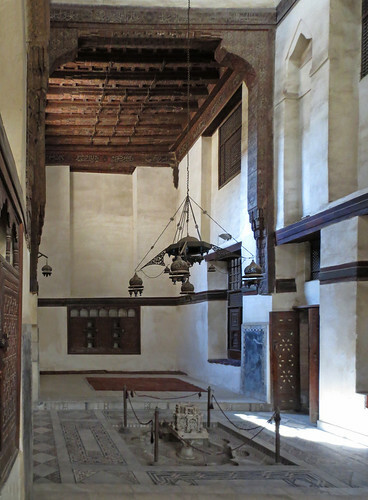 The lamps are interesting viewed in the context of the room or by themselves. 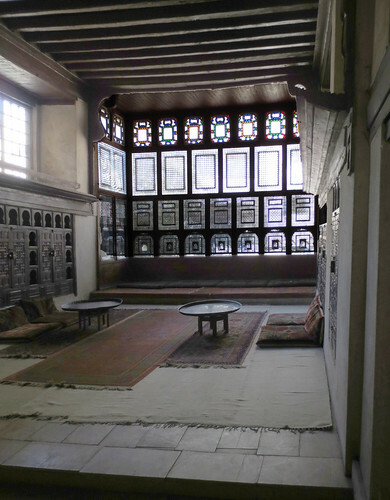 And there are a few pictures of the house before restoration that are interesting. 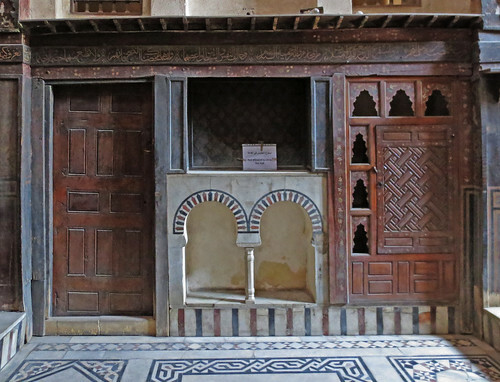 Like almost all monuments in Cairo, there is no brochure with details available, so bring along a smart phone or other device to scan a site such as this one to make sure you see everything. 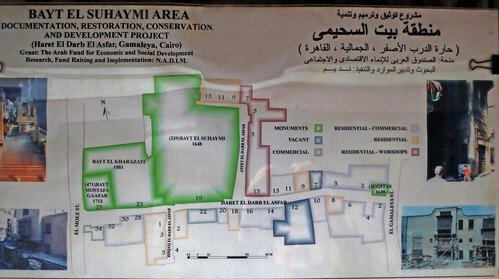 We missed an entire section so now we will have to return to Cairo next winter to see that part of the house. 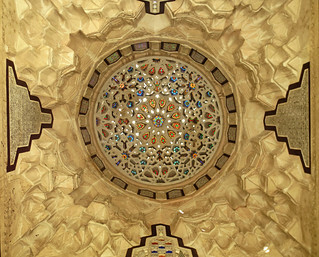 As always, just click on any of the pictures above to go to our Flickr site and see the photos in greater detail. Are You Watching the Economic Conference?